The new XPS insulation panels facility in Dammam. ARNON Plastic Industries Company has been on the expansion path, having recently added a new line for the production of extruded polystyrene (XPS) insulation panels in Dammam, Saudi Arabia. The facility is one of four plants located in Dammam’s Second Industrial City, in addition to its newly launched factory in Riyadh. The company now has plans to install an XPS line in the Saudi capital as well to cater to the requirements of that market. Arnon anticipates a surge in demand for its insulation panels on the back of a government drive to get contractors to use thermal insulation sheets on their projects. This will help in saving electric energy and reduce the cost of cooling buildings, Altaher says. The company also opened its first factory in Riyadh last year. This facility has modern, integrated production lines for polyethylene (PE) and polyethylene terephtalate (PET) products, in addition to huge warehouses, and aims to cater to the steady growth in demand in the Central and Western provinces. Latest technology at the new facility. 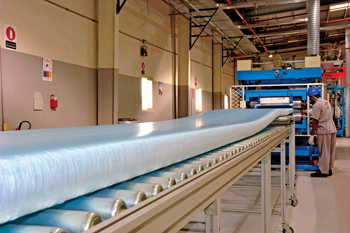 The Riyadh factory produces PE sheets in different thicknesses as well as back-up rods, PS products and some kinds of PET products, which are supplied to the market directly from its warehouses by Arnon’s sales teams. Arnon’s XPS thermal insulation sheets are currently being used in a diverse range of construction projects in wall and roof insulation. Altaher says Arnon is keen on providing high-quality products and outstanding services to meet the growing needs of the market. Arnon is an affiliate of Al Fozan Group of Companies, a leading trading, investment and industrial group in Saudi Arabia. The company was established in 1999 and commenced production in the beginning of 2000. Arnon specialises in the production of PE rolls and thermal insulation sheets for the construction sector in addition to food trays and containers made from polystyrene (PS) and PET. The company produces a wide range of high-quality products which include PE foam products (heat insulation, carpet and parquet underlay, back-up rod, sound insulation and wrapping material), PET products (food containers and packaging material), and PS foam products (trays and dishes). Its underlays reduce the stiffness of flooring systems and dampen the sound of footsteps. Other products include polyethylene packaging materials for various uses and expansion joints, amongst others. “Arnon is the largest manufacturer of such products in the Middle East and has the largest market share in this sector in Saudi Arabia in particular and the Gulf in general,” says Altaher. He points out that Arnon achieved excellent results last year, which has boosted its confidence in the future of the plastics industry in Saudi Arabia, and expects oil prices to significantly affect the petrochemical industry, explaining that it has a knock-on effect on the cost of raw materials used in production and hence impacts the prices of end products. 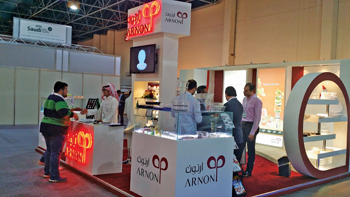 Arnon’s stall at The Big 5 Saudi in Jeddah. In order to maintain a strong presence and create awareness of the company’s diverse range of products, Altaher asserts the importance of participating in regional as well as international events, as “they represent a major factor that promotes the development of the company, and boosts relations between Arnon and its customers in those countries”. Some of these exhibitions have included The Big 5 show in Dubai, UAE, and The Big 5 Saudi in Jeddah, Saudi Arabia, where the company showcased its latest products and interacted with visitors, answering their various queries. Furthermore, the company regularly participates in the construction and projects forums held in Riyadh as they focus on the development strategies of the building and construction sector while providing an insight into how the work environment and efficiency can be improved and how to avail of the investment opportunities in the sector. He emphasises that Saudi Arabia has the largest and most important market share in the regional construction sector with projects worth more than SR2.2 trillion ($586 billion), providing ample opportunities for companies. Arnon’s sales offices are located in Dammam, Riyadh and Jeddah.